Your military stay in San Diego deserves a facelift. Opt for off base military housing during your military assignment and get a taste of what life is like in America’s Finest City. At Foxwood Corporate Apartments, you’ll have the best of both worlds, a beautiful home in a convenient location! While you could choose the barracks as a place to stay while you’re in San Diego, try something new! Enjoy the West Coast lifestyle with beautiful resort-style accommodations on a lush greenbelt garden park right here at Foxwood Apartments! Our spacious, one- and two-bedroom military apartments feel just like home. Completely furnished with designer dÃ©cor, every one of our apartments comes with a full kitchen and new appliances, a wonderful living room area and quaint dinette space, and big bedrooms with fresh linens. You’ll have everything you need with Foxwood Apartments, we will provide you with lots of essential amenities throughout your military stay. For a full list of amenities, please visit our website. Another thing you’ll love about Foxwood Corporate Apartments is the convenient location! We have lots of on-site parking so you’ll never be without a place to park and the easy-to-access freeways like the I-5 and I-805 are just blocks away. If you plan on commuting to San Diego Naval bases, you’re in luck. Our convenient location makes it easy for you to enjoy off base military housing without the added headache of a long commute to work. 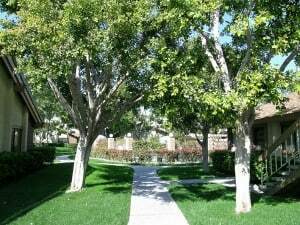 Every bit of your stay in San Diego will be a delight when you choose the military housing at Foxwood Corporate Apartments. With phenomenal accommodations and a great location, you can rest assured that your military stay in San Diego feels more like a vacation. You’ll also love our special discounted military rate, hurry and check to see what you can save with Foxwood Apartments’ off base military housing! Do you ever come to San Diego on a business trip or extended corporate stay? Don’t settle on a less-than-average hotel room. Our corporate housing at Foxwood Corporate Apartments allows you to enjoy your stay in San Diego even though you’re in town for business purposes. You’ll love all the perks included in our furnished corporate apartments. Choose from a variety of one- and two-bedroom business suites that are fully equipped with all the living essentials you will need while staying in San Diego. The full-size kitchen is great for preparing meals at home, with all the cookware, kitchenware, and dishware provided, you’ll be able to whip something up in the kitchen whenever you feel like it. The spacious living room is ideal with a cable-ready TV and DVD player so you can kick up your feet and relax after a long day at the office. On-site laundry facilities, fax and copy services, and weekly maid services are also available during your corporate stay at Foxwood Corporate Apartments. Our corporate accommodations at Foxwood are spacious and beautiful and the gorgeous scenery surrounding the apartment complex is like a vacation hot spot. When you stay with Foxwood Corporate Apartments, you’ll feel as if you’re staying at a country club resort! With large shade trees, beautiful gardens, and a heated pool and spa just steps away from your corporate apartment, the quiet and relaxing environment will be just what you’re looking for in corporate housing. Spend your time away from the office in a vacation-style setting, and the convenient location of Foxwood Apartments will ensure that you’ll have an easy commute to wherever you need to go. For the best in San Diego corporate housing, choose Foxwood Corporate Apartments as your home away from home. Contact us today to find out more about our corporate apartments and our easy application process. We look forward to providing you with a luxurious corporate stay in America’s Finest City! It was a solemn moment at Naval Base San Diego as the mighty frigate USS Curts was decommissioned on Friday after 30 years of service. USS Curts was bearing a black flag from its mastÂ with the message â€œDon’t Give Up the Ship.” Within the audience were 9 of the 20 commanders that once guided USS Curts on some of the most epic Naval missions in history. The decommissioning ceremony on Friday morning struck USS Curts from the official Naval roster, a bittersweet occasion for many amongst the crowds, especially the heroic commanders of this noble ship. The USS Curts, often referred to as â€œ.38 Specialâ€ due to its hull number FFG 38, has become an outstanding component of the Pacific Fleet. From freeing a Kuwaiti island during Operation Storm Desert to vacating the Philippines with hundreds of military dependents once Mount Pinatubo exploded, USS Curts has had one wild adventure during its 30 years of service. But that’s not all USS Curts experienced during its service time. During the Persian Gulf War, USS Curts captured an Iraqi garrison on Qaruh Island and took 51 Iraqi prisoners. The vessel also destroyed mines and sank an Iraqi minelayer during the Battle of Bubiyan Island. USS Curts, however, is more currently associated with its aid in anti-smuggling missions. In 2004, USS Curts seized 12 tons of cocaine, which is the largest maritime interdiction of cocaine in history. USS Curts continued on its quest to fight smuggling endeavors in the Eastern Pacific and Caribbean Sea up until its last deployment. According to federal officials, the Curts crew was able to seize more than $26 million in illegal drugs, arrested over 30 traffickers, and destroyed seven ships. The San Diego-based USS Curts will always be remembered for its courageous actions as well as the admirable man that the vessel was named after. The USS Curts was named after Admiral Maurice E. Curts, an important asset to the U.S. Navy during World War II. The Navy decided to decommission USS Curts in order to slowly begin swapping the Oliver Perry-class frigates like Curts with more versatile littoral combat ships and destroyers. USS Curts will soon be towed to Hawaii where it will take offers for sale from foreign navies. If USS Curts seizes to sell, it will eventually be scrapped. Newport Beach is the perfect destination for a long weekend if you’re looking to have some fun. Located in Orange County, Newport Beach is notorious for its pristine houses and immaculate residential areas, funky shopping districts, and exciting attractions. It’s just a short trip from San Diego by car and the drive will be well worth it. Stay for the weekend and enjoy the picturesque beaches, huge harbor area, and many great things to do. Here are some of the highlights in Newport Beach attractions, these are places you MUST see! Balboa Island is my favorite place in Newport Beach. The main street called Marine Avenue has great shops and boutiques, restaurants, and art galleries. It’s the perfect place to window shop! Walk around the neighborhoods and you’ll see unique homes with pristine gardens in the front yard. â€œThe Islandâ€ is actually a series of three islands (Balboa Island, Little Balboa Island, and Collins Island). To get here from Newport Beach, it’s fun to ride on the Balboa Island Ferry, the ferry has been in service since 1919! Newport Beach is so popular with tourists and locals alike. Check out their one-of-a-kind beach culture and unbelievable surf during the day and come back at night to walk down the long pier. Newport Pier has lots of great restaurants, shops, and little boutiques along the way, the pier is one of the best places to hang out on a Friday night. Fashion Island is THE ultimate shopping experience for the diehard fashionista. As Southern California’s most luxurious shopping destination, Fashion Island has all the best luxury, designer, and high-fashion stores and boutiques like Nordstrom, Neiman Marcus, and Bloomingdale’s. Fashion Island also has incredible restaurants for you to try when you need a break from shopping. Crystal Cove State Park is a historical part of Newport Beach. Made up of 3.2 miles of beaches and 2,400 acres of protected backcountry, Crystal Cove State Park offers a variety of fun activities like hiking, biking, swimming, surfing, scuba diving, and horseback riding. You can also stay at Crystal Cove State Park, there are over a dozen restored cottages from the 1930s that are great for a vacation rental. Newport Beach has a lot of excellent hotels and accommodations that will please any visitor. Depending on where you would like to spend the majority of your time, use this Newport Beach hotel finder to locate your ideal â€œhomeâ€ while in Newport Beach. If you like seafood, then you are in for a treat! Newport Beach is a fishing town and the seafood at Bear Flag Fish Company is the best place to get fresh seafood with exceptional service as well. The modern atmosphere is fun for an afternoon of fish tacos or a more elaborate dinner. For the coffee junkies and breakfast lovers, Pain du Monde is a quaint cafÃ© that serves privately roasted coffee and espresso, homemade bakery, and savory breakfast options. Start your day in Newport Beach at Pain du Monde and you’ll be ready for anything. When you’re on vacation in San Diego, the last thing you want to do is be miserable about where you’re staying! Instead of choosing a crowded hotel room with no kitchen and limited amenities, opt for a comfier, cozier place to spend your days while in San Diego. If you need temporary accommodations in San Diego, check out our fantastic one- and two-bedroom furnished apartments here at Foxwood Corporate Apartments. Our temporary apartments are completely luxurious with gorgeous furniture, a full-size kitchen, spacious rooms, and an open floor plan. Not only do our temporary apartments have all these luxurious features, they also come equipped with many convenient amenities to make your vacation feel like home. The kitchen area has all the kitchenware, cookware, dishes, glasses, and silverware that you’ll need to prepare a meal at home. The living room provides guests with a cable-ready TV and DVD player so you can plan movie nights or watch the news whenever you’d like. Other amenities are also available. Check out our amenities list at Foxwood Apartments to see what else will be included in your temporary apartment. There are many perks to staying in a temporary apartment versus a hotel while you’re in San Diego. When you stay at Foxwood for a temporary vacation, you’ll fall in love with the 5 acres of greenbelt garden park that our apartments are surrounded by. The colorful plants and flowers, large shade trees, and curved paths will make you feel as if you are staying at a country club resort! But that’s not all! Dive into our year-round heated pool and spa to thoroughly enjoy this piece of paradise. At Foxwood Apartments, we want you to love your temporary stay in San Diego. For the most relaxing, luxurious, and unforgettable experience in San Diego, choose to stay with us at Foxwood Corporate Apartments! We guarantee you’ll fall in love with our beautiful temporary apartments. Contact us today for more information about our rooms, amenities, and the application process.